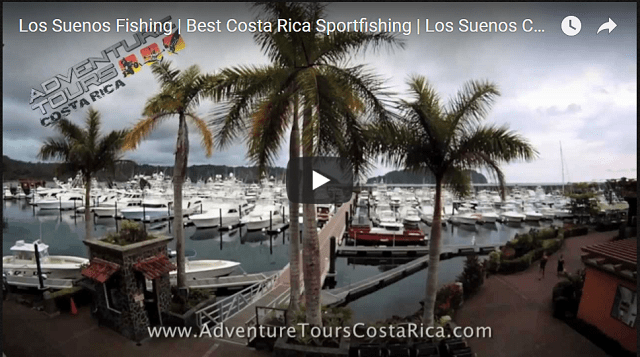 Enjoy 5-Star Luxury Accommodations and World-Class Sportfishing at the Los Sueños Resort & Marina - home of the annual WBS and IGFA Los Sueños Signature Billfish Series. Our Fisherman's Dream Getaway tour begins with Private VIP pick-up from the Juan Santamaria International Airport in Alajuela/San Jose (SJO). Your personal Adventure Tours Costa Rica driver will be waiting for you as you exit the airport. Look for your name on the placard right below the Adventure Tours Costa Rica logo. "Enjoy private VIP transport with your own bilingual driver to your accommodations." Once you have stowed your luggage and are comfortably aboard one of our air-conditioned, top-of-the-line, late model vehicles, we are happy to welcome you to Costa Rica with a complimentary beer, soda or water waiting for you in the vehicle. Our professional, bilingual drivers are knowledgeable about the native flora and fauna that adorns the gorgeous countryside views you will take in on the pleasant trip from the airport to your luxury accommodations in Los Suenos Costa Rica. Your personal driver will be happy to answer any questions that you may have. "Once you are settled in your luxury condominium, you will find that no expense has been spared." This package allows you to choose ANY condominium from our inventory of First-Class Luxury Condominiums. Upon arriving in Jaco and Los Suenos, your personal Adventure Tours Costa Rica concierge will assist you with condo check-in, as well as serve as your local contact to ensure that your vacation is carefree and seamlessly handled from start to finish. Your personal concierge will also provide you with a complimentary local cell phone for your convenience and peace of mind. As such, you know that we are easily accessible for the duration of your vacation with us in Costa Rica. Once you are settled in your luxury condominium, you will find that no expense has been spared. Our luxury Los Suenos and Jaco condos feature modern kitchens, granite countertops, stainless steel appliances, washers and dryers, flat panel TVs, cable, wireless internet, and personal safes. The views of the ocean from your condominium and the gentle sound of the waves crashing against the shore serve as a relaxing and peaceful backdrop. "Enjoy 2 Full-Days chasing billfish, wahoo, yellow fin and mahi." You will enjoy 2 Full-Days chasing billfish, wahoo, yellow fin and Mahi (dorado) on a 38-ft World-Class twin-engine cabin cruiser. Unlike many fishing destinations around the world, where arriving at a prime fishing location involves traversing rough seas for hours at a time, the waters of Costa Rica's Central Pacific Coast are calm. The unique geography of the Costa Rican mainland serves to shield the waters of the Central Pacific Coast from high winds and generally allows for a relatively smooth and short trip from the mainland out to the best fishing in the world. Outside of sport fishing, you will also choose from a range of other tours that allow you to fully experience and take advantage of all of the recreational opportunities Costa Rica has to offer. Included in this package is your choice of a variety of other exciting tours that allow you to explore various aspects of this tropical paradise. Choose to spend a day exploring Costa Rica’s rainforest and waterfalls on an ATV, surfing one of her world-famous Pacific waves, or zip-lining through the rainforest canopy. Just a few examples of the many exciting experiences you have to choose from on this dream package. On the last day of your Fisherman's Dream Getaway package, your personal driver will arrive at your condominium to transport you back to the Juan Santamaria International Airport in Alajuela/San Jose (SJO). As with your arrival in Costa Rica, you can sit back and relax, as our professional drivers and staff ensure that your return transportation to the airport is seamless and easy. We know it's tough to leave Costa Rica, but we are confident that this dream fishing vacation in Costa Rica will leave you thinking about your return.